Because we typically see far fewer bugs in the winter, it’s a common misconception to think that fall perimeter pest control is a waste of time. After all, it’s cold outside. Insects die off when it’s chilly out. They aren’t reproducing, building nests, or terrorizing our back yard parties. Why bother getting your property treated for insects when they are nowhere to be found? Bugs Don’t Really Take a Winter Holiday. Part of the reason we see less insects in the winter is because they go into hiding…and often times, they are hiding in your house! Colder outdoor temperatures drive the bugs into our warm, cozy homes. They may not make their presence known, but chances are, they are lurking inside your walls and in your crawl spaces. And come springtime, they will re-activate and likely create quite a nuisance on your property. It May Not Be Too Late for Perimeter Pest Control. Fall and early winter in Atlanta is certainly not too late to treat your perimeter for pests. Fall perimeter pest control can really help cut down on the number of critters taking up residence in your home for the winter. Treating the perimeter of your property creates a barrier that most insects will avoid, rather than cross. If it has to be your house or your neighbor’s, then treating your perimeter for pests will drive those bugs toward other people’s homes. Perimeter Pest Control Now Makes for a Sweeter Spring. Treating your perimeter for insects right now will reduce the number of spiders, roaches, ants, and other bugs you see in the house all winter and into spring. Fewer treatments necessary in the spring and summer, fewer bugs to clear out with your vacuum or traps – a little proactive effort can go a long way. Atlanta’s mild winter weather means insects can easily hole up in protected spots and survive for months. When you don’t have massive die-offs such as the ones our northern neighbors experience, it can mean heavy infestations once springtime hits. Perimeter pest control is a smart way to protect your entire property from crawling invaders all year long. Now Is the Time to Ask about Perimeter Pest Control. A perimeter pest control barrier can protect your home, your lawn, shrubs, trees, and vegetable gardens from unwelcomed guests. 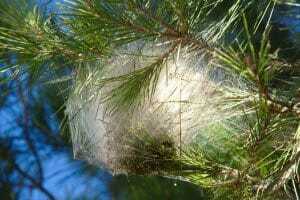 If you have ever had a tree decimated by tent worms, you know that the damage can happen fast. But having your property’s perimeter treated with pest control products can keep all of your landscaping protected from devastating bugs. 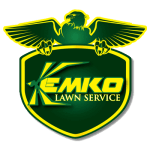 Kemko Lawn and Shrub has served the landscaping needs of Atlanta’s homeowners for over 30 years. We know what it takes to create the thick, healthy, green, pest-free lawn of your dreams. Click this link to request a free estimate for your fall perimeter pest control application.